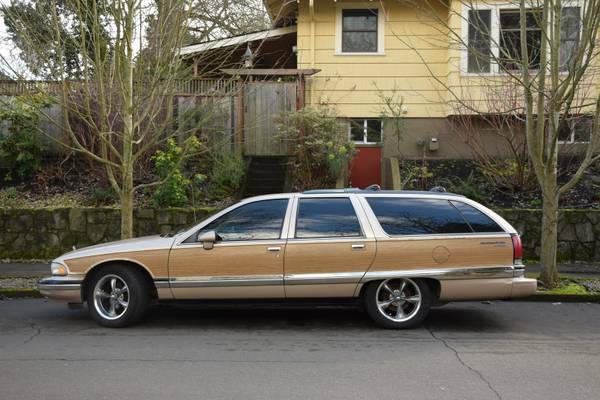 The Buick Roadmaster Estate is a highway cruising leviathan that was built for Buick as a badge engineered version of the Chevrolet Caprice Estate. The B-body behemoth hits the scales at 4,700 lbs and was the last full sized body-on-frame wagon to be assembled by an American automaker. 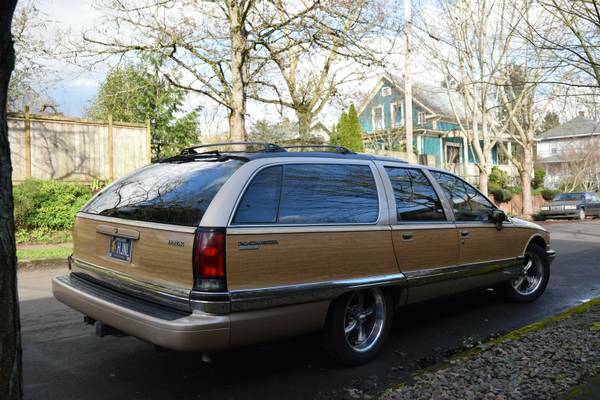 Find this 1994 Buick Roadmaster Estate offered for $4,999 in Portland, OR via craigslist. Seller submission from Ian. The Roadmaster wasn't your average land barge -- it was an above average land barge powered by a variant of the Chevrolet Corvette V8. The LT1 in the Roadmaster was rated at 260 horsepower (down a few from the Vette) and 330 ft-lbs of torque -- and with the stock 4L60 automatic, the Roadmaster makes more of a towing machine than a sports car. 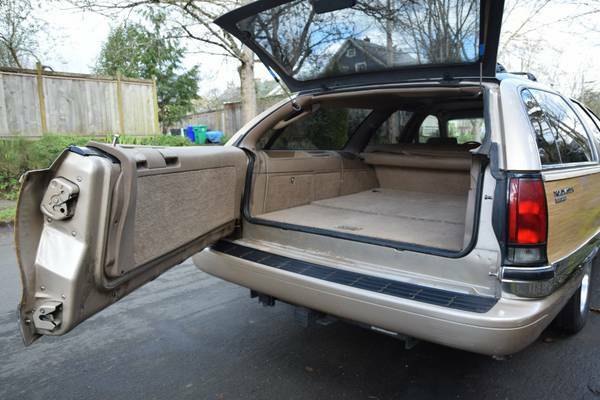 However, with seating for 8 people (3 front row, 3 second row, 2 in back) the Roadmaster offers people hauling capability mixed with trailer hauling and occasional arse hauling. The stock torque converter engagement makes the Roadie feel a bit sluggish right off the line, but once up on plane it feels faster than you'd ever expect. Nice looking wagon. My kids would love to ride as tail gunners. Why is the seller keeping the license plates? The bike plates are still available from the OR DMV and only cost an extra $10 which goes to charity. "was the last full sized body-on-frame wagon to be assembled by an American automaker." An American automaker is never late to adopt new technology. Nor is he early; he engineers precisely when he means to. I have a surprisingly large pile of '30s Chevy Dubonnet IFS suspension pods around here that support that thesis. A clever design brought down by a couple minor but crucial engineering flaws. This ticks so many boxes for my MWMU. Location could be a problem, but nothing's impossible. That thing can swallow a lot more tire depending on your goals. Back in the day, I thought the whole Shamu thing was entirely correct, these were bloated beyond all redemption. But with time and the proliferation of 5000lb minnow-chassised whale crossovers my attitude has mellowed a lot. But I don't do woodgrain. Strip the fornicator to bare metal and paint it '00 BMW M5 Silverstone Metallic. Then in goes the LSA and 4L90E and 3.73 rearend. Yee-hah. Yeah, I could see owning one. Oh, and for what it's worth, GM sells the LSA as a crate marine engine, which implies they think it'll run at > 60% throttle forever because that's what marine engines in that class are expected to do. So, sounds like a damn good towing motor to me.